I'm trying to decide what to knit next. The white socks and the baby surprise sweater are almost finished, and the vest is resting while I decide whether or not to continue it. 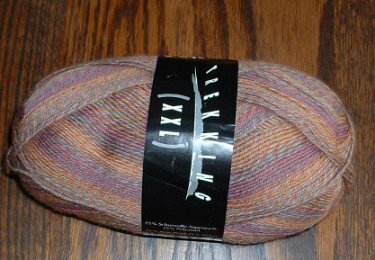 I have had a ball of Trekking XXL (color 105) for a few weeks now, just waiting to be made into socks, but I made myself wait until I finished up some of my other projects. I love the fall colors in this, and it's so soft and springy! I want to make socks that have the ribbing all the way down to the edge of the toe--Mom has a pair like that, and I hadn't seen any like them before. After searching the internet, I found a beautiful pair here (see June 27th entry). I can make my own pattern based on the pictures; I only hope mine turn out as nicely! Of course, it's time to think about holiday knitting, too. I already have a few things completed, but I really need to decide what else I'm going to do, and then get busy. I always get a few last-minute requests, which I am happy to fill, as long as there's time. So as not to waste an entire day, I resolved to finish "Branching Out," and here it is, though unblocked. I'm really happy with the way it turned out and am relieved that it's done since I started it over the summer while we were at the lake. It's done in Knit One, Crochet Too's Douceur et Soie, in "dove," I believe. I knit very tightly, so this was done on size 10 1/2 needles. It was slow going, and I was constantly afraid of dropping a stitch or a yo. 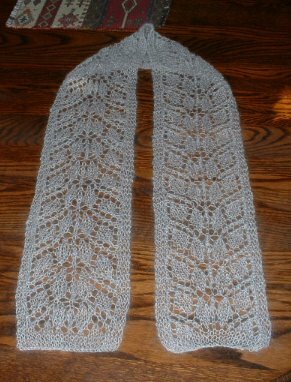 Next time I do a project like this, I will use some lifelines so I can relax a little more while knitting. This will be a Christmas gift for a relative who doesn't have internet access. I'm a constant knitter. I generally have at least six projects going at any one time, and sometimes more. Right now I have a "Branching Out" scarf, a sock, a vest, and an EZ's Baby Surprise Sweater on the needles, so I guess I'm a little behind my average. I just sent half a baby blanket to the frog pond after realizing I don't have enough yarn to finish it, and it's been discontinued. 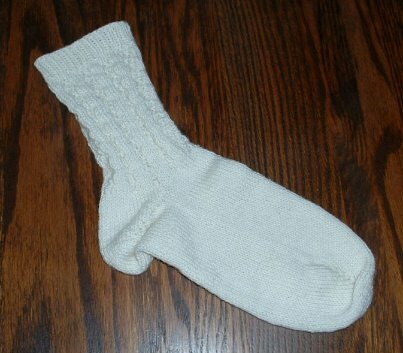 Here's one of the socks. It's my own design, inspired by a pair I had bought that had subsequently gone holey in the heel. It's made of Paton's Kroy, color "whitecap." 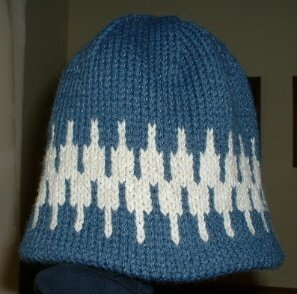 Here's a hat I just finished. 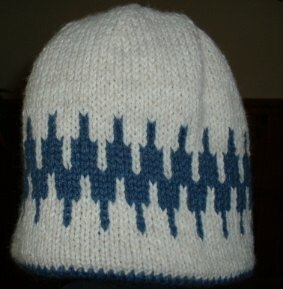 It's the double hat from EZ's Knitting Workshop, made from some scrap Woolease. I decided I needed something really warm for walking in the coming cold weather.